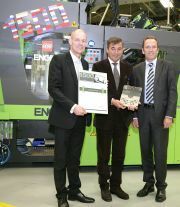 ENGEL AUSTRIA handed over its 1500th injection moulding machine to the LEGO Group at the beginning of December. LEGO® elements in many shapes and colours are produced on ENGEL injection moulding machines at the LEGO sites in Denmark, Hungary and Mexico. ENGEL and the LEGO Group have enjoyed a good working relationship for over 40 years now and have driven many new developments forward together over the course of this period. One of the main contributors to the relationship is the interest of both companies in sustainability. “It is our ambition to have a positive impact on the environment,” stresses John Hansen, Senior Vice President and Head of Quality & Engineering at the LEGO Group. “We are in the business of play, and children are our vital concern. They inherit both the future and the planet, and they have a right to a healthy and rich environment. That’s why we have devoted ourselves to sustainability and place so much emphasis on it. This means that with regard to injection moulding, we invest exclusively in energy-efficient machines. ENGEL technologies are part of this.”The LEGO Group works out which drive system and process technology is the most energy-efficient solution to meet its needs in conjunction with its supplier in each individual case. ENGEL supplies LEGO factories with both servo-hydraulic and all-electric injection moulding machines. Just under half of the 1500 injection moulding machines supplied by ENGEL in the last four decades are in use at LEGO Group factories today. The demands on the machines have grown continuously throughout this period. Christian Pum says: “We always look forward to new challenges with the LEGO Group. I am sure our partnership will be making an important contribution to the continuous development of both companies in the future as well.